What if Link and Zelda were a badass part of the Marvel universe instead of the Nintendo one? I think their gear would look a little like this. 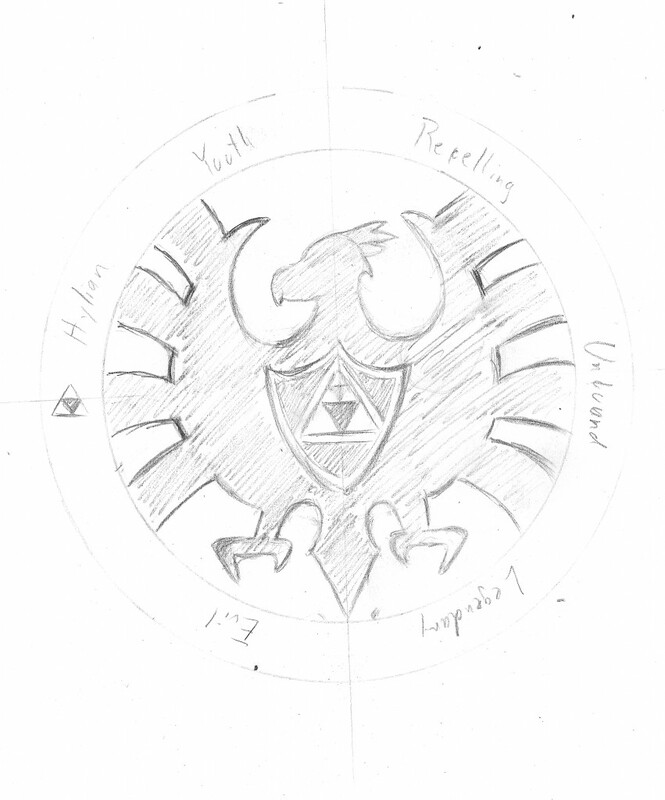 This is obviously a mashup of the Hylian Shield iconography and the sharp, stoic bird that represents S.H.I.E.L.D. At play here is a switch of the bird to Link’s Loftwing, replacing the very plain shield in the bird’s chest with a representation of the Hylian Shield itself, and the iconic three hearts that Link begins many quests with replacing the single bullet point at 10 o’clock on most representations of the S.H.I.E.L.D. logo. The periods are also replaced by rupees in the name at the bottom. I’m pleased with this one for a number of reasons. Namely, I finished it in three days and used Illustrator rather than Photoshop to deliver a final product. Working with the vectors for this was much easier in that program, and syncing up font faces and other elements became a breeze after a while. Progress pieces from my Instagram account below, including my original sketch for the idea. And a note for fun: I was trying to develop a S.H.I.E.L.D. variant using “Hyrule” and “legendary division,” but I filled the gaps in for the other name first. This entry was posted in Freelance, Wearable Art and tagged crossover, illustration, legend of zelda, marvel, mashup, nintendo, t-shirt, video game, work in progress, zelda. Bookmark the permalink. ← Great Scott, Dr. Light!